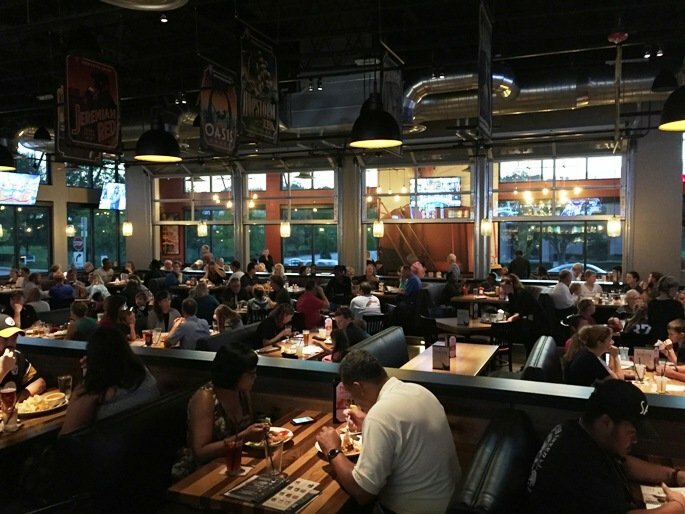 First Take: BJ’s Restaurant and Brewhouse for Beer and Bar Food! When it comes to beer and brewpubs, there’s no end to the choices in that category. 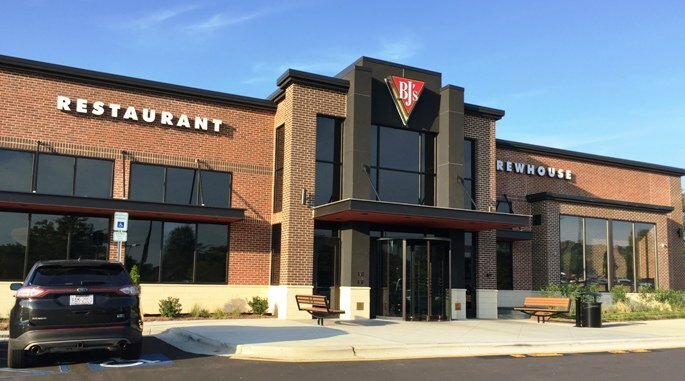 So I was a bit curious to hear about BJ’s Restaurant and Brewhouse opening up at Cary Crossroads! A chain based out of S. California. BJ’s Restaurant and Brewhouse has one other location in NC in Charlotte but Cary would be it’s first for the Triangle. So is there room for another restaurant focused on beers and burgers? It was time for a visit to find out more about BJ’s! 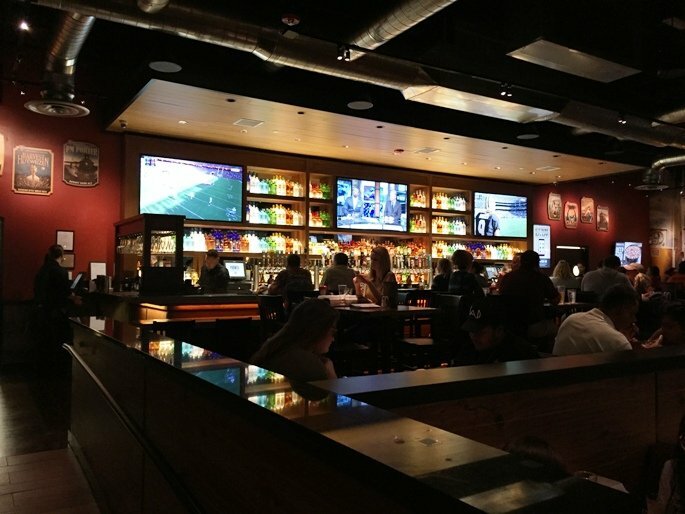 Located in the spot that used to be a Golden Corral, BJ’s Restaurant and Brewhouse has a totally modern feel inside, probably most similar to the Yardhouse out in Raleigh. There’s a beautiful, modern bar to the right with a display of lit liquor bottles. The rest of the dining area is open and jammed with hungry diners. A set of garage doors open up to a quasi patio area. It’s not really a patio because the outer area is also enclosed but you certainly get that patio feel. 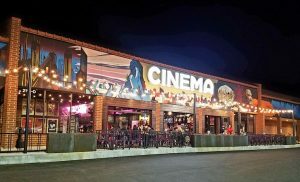 The space is modern, lively and energetic which is a great start if you’re dining here. During my two visits to BJ’s, I’ve sat in the bar area at a high-top where you perch above all the action. Beer chalkboard menu to the right shows some of their specials on tap. BJ’s obviously brews its own ales across a spectrum of styles and I can tell you that they are pretty decent beers for sure. BJ’s Brewhouse also offers wine, cocktails and a food menu focused around American bar food. BJ’s Restaurant menu is substantial, covering a wide swath of salads, sandwiches, burgers, pizzas and entrees. 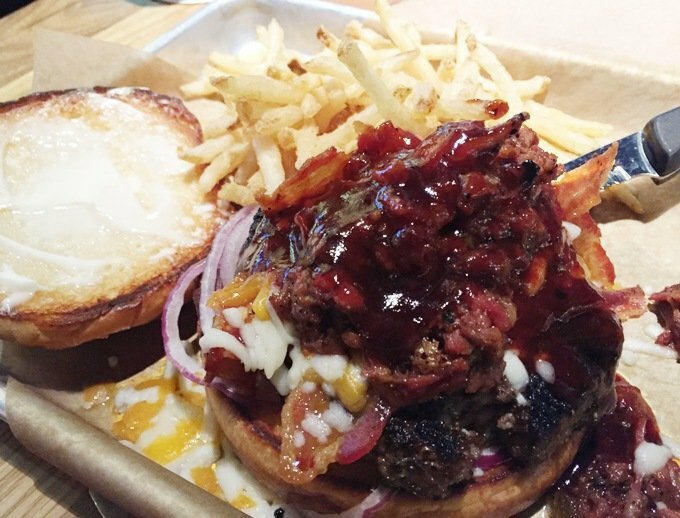 The brisket and bacon burger is messy but totally worthwhile! 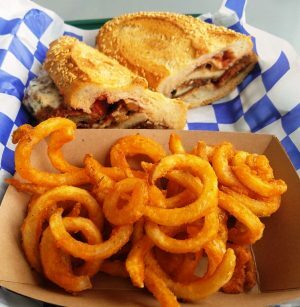 Covered in barbeque sauce, chopped brisket, bacon, two types of cheeses and red onion, we’re talking about a coronary on a plate! Oh and how about a dab of mayonaisse on the bun for good measure? But it’s worth the mess, you may have to finish it off with a knife and fork but they are worthwhile calories. BJ’s origins are as a pizza place so you can bet their deep-dish pizza is good! It’s more of a pan-style (double-proofed dough) that offers up the light, crispy and fluffy crust with the seared cheese on the edges. My five meat pizza came topped with a generous portion of pepperoni, meatball, ham, bacon and sausage. An excellent bite and plenty filling for one person. 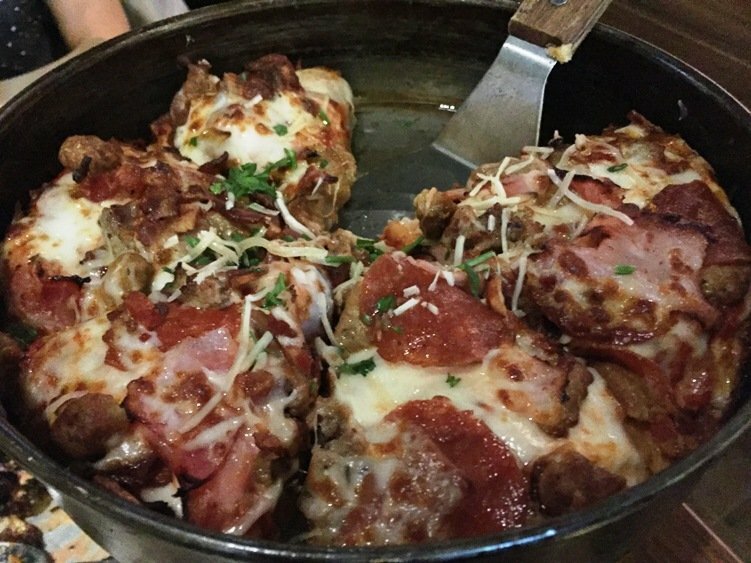 BJ’s serves its pizza in four different sizes so you can certainly share at the table if you’re willing to! BJ’s specialty dessert is its Pizzookie (pizza-cookie) and while I haven’t tried it at this location, it’s dangerously caloric and good. Service at BJ’s is solid but your usual chain scenario. They tend to higher a bit younger and do a mixed team service so don’t expect a super-sophisticated meal service. Just be aware that BJ’s is quite popular and the crowd will certainly impact service quality here. 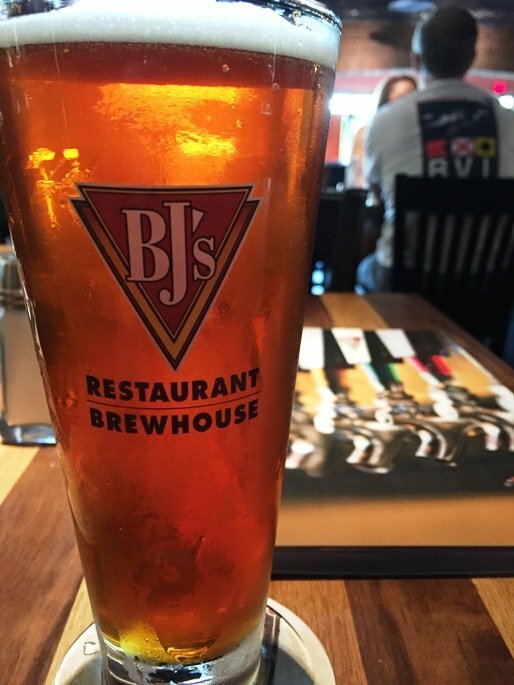 With the handful of TV’s at the bar you can catch the game but BJ’s Restaurant and Brewhouse is definitely not a sports bar. It just feels like one but more upscale! So welcome to the neighborhood and the Triangle BJ’s! You’re a welcome addition to Cary Crossroads and I think you’re going to do just fine.